John Sullivan: Executive Chairman; Rick Hoefling: President and CEO; Joel Raymond: Chief Operating Officer; Sean Frick: CFO. CommutAir, operating as United Express, is an American regional airline founded in 1989, and is majority-owned by Champlain Enterprises Inc. Today, CommutAir operates more than 800 weekly flights to 30 plus destinations, with Embraer ERJ-145XR aircraft, from its bases at Newark Liberty International, NJ and Washington Dulles International. In 1979, a commuter airline using the name Commutair operated intercity shuttle service in the Houston, Texas area between Hobby Airport (HOU) and Intercontinental Airport (IAH) and also between Sugarland Airport (SGR) and Intercontinental Airport (IAH) with de Havilland Canada DHC-6 Twin Otter and Beechcraft twin turboprop aircraft. The airline was established in 1989, with headquarters at Clinton County Airport in Plattsburgh, New York. Operations began on August 1, 1989 as a marketing affiliate of US Air. The airline changed affiliations to Continental Airlines in December 2000, when US Airways and CommutAir failed to reach a mutually acceptable extension agreement, and thus decided not to renew the codeshare agreement. In July 2001, the company announced plans to downsize its fleet and workforce by approximately half and change the route structure of the airline. In early 2002, the company began a "micro-hub" operation based in Albany, New York. At its high point in 2003 and 2004 the hub served 21 cities within the Northeast and Canada with a fleet of Beechcraft 1900s. Service was also provided out of Boston's Logan International Airport to several Northeast cities. In January 2003, CommutAir announced an agreement with Continental to feed the latter's Cleveland, Ohio hub. Service commenced on March 16, 2003 serving Kalamazoo, Michigan and Elmira, New York. Two cities were added the following month and by August 2003, CommutAir served 12 cities from the Cleveland hub. CommutAir leased sixteen Bombardier Q200 aircraft from Horizon Air in 2006. 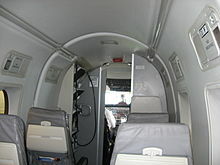 The following year, the Beech 1900s were phased out. On October 30, 2007, the company moved all remaining operations from Clinton County Airport, due to the closure of the airport. All operations were then conducted out of Cleveland Hopkins International Airport. On October 2, 2008, the company began operations out of Newark Liberty International Airport, following Continental Airlines plan to adjust to the softening industry. Commutair's pilot group voted for union representation by the Air Line Pilots Association in 2008. That same year, Continental Airlines announced that it would cut flights and more than 3,000 jobs. Subsequently, it was announced that some of CommutAir's flights would be eliminated as part of Continental's cutbacks. In 2011, United Airlines asked CommutAir to obtain five Bombardier Q300s. Two of the aircraft were allocated to Cleveland services and three aircraft were allocated to Newark services. In 2012, CommutAir opened a hub at Washington-Dulles International Airport. In July 2014, CommutAir closed its pilot base in Cleveland Hopkins International Airport after United Airlines withdrew its Cleveland hub. CommutAir also closed its Cleveland maintenance base, and replaced it with a new maintenance base in Albany, New York. On November 9, 2015, CommutAir announced that it has reached an agreement with United Airlines to significantly increase the number of airplanes flown under the United Express brand by adding Embraer E145 jet operations to the company's existing fleet of Bombardier turbo-prop aircraft. July 2016, CommutAir begins commercial service with its inaugural flight on the ERJ-145XR jet from Washington, DC to Columbia, SC. In September 2017, the Q300 was phased out and in January 2018, the Q200 was phased out, marking the end of turbo-prop operations. Albany, New York - Albany International Airport. This is CommutAir's main maintenance base. The airline has had a maintenance base in Albany since 2014 and the base has expanded significantly since then. As of January 2018, CommutAir average fleet age was 13.0 years old. The CommutAir fleet was once composed entirely of Beechcraft 1900D aircraft, operated for US Airways Express and later for Continental Connection. CommutAir operated the final turboprop flight for United Express on Sunday, January 7, 2018. This flight, UCA4909/C54909 between Syracuse Airport and Dulles Airport was operated by tail number N363PH. It marked the end of an era for both CommutAir and United Express. The Bombardier Q200 was subsequently ferried to Roswell International Air Center for retirement. CommutAir Flight 4821, a Beechcraft 1900 operating for USAir Express was flying from Plattsburgh, New York to Newark, New Jersey, with stops in Saranac Lake and Albany in New York. On January 3, 1992 the aircraft crashed into a wooded mountaintop as it was landing at Adirondack Regional Airport. Of the four people on board (two passengers and two crew), two were killed while the other two sustained serious injuries. Shortly before the crash occurred, the aircraft had contacted Commutair officials on the ground at Lake Clear Airport. The aircraft was new and the crew was experienced. Immediately following the accident, there was no clear cause. Of the deceased, one was 23-year-old copilot Dean Montana, and one was an off-duty employee. The aircraft was not required to be equipped with a flight data recorder, therefore a flight data recorder was not present. The cockpit voice recorder was burned to the point that the data inside was not usable. The National Transportation Safety Board used aircraft position data from air traffic control, the aircraft wreckage, survivor interviews, and weather information to find its probable cause. The cause of the crash was determined to be pilot error in establishing a stabilized approach and cross-checking instruments. Factors related to the accident were: weather conditions and possible precipitation static interference, caused by inadequate grounding between the radome and fuselage that could have resulted in unreliable glide slope indications." On March 4, 2019, United Air Flight 4933 operated by CommutAir skidded off the runway during its second attempt at landing in Presque Isle International Airport in Presque Isle, Maine.. The front landing gear were torn from the plane and embedded in one of the two rear engines. Passengers and crew were evacuated from the main door, with three passengers requiring treatment for minor injuries as well as one pilot..
^ "CommutAir.com History". Retrieved October 12, 2009. ^ "Delta announces Big Sky flight schedules; Press-Republican.com, October 02, 2007". ^ "CommutAir Pilots Vote ALPA:NMB Election Results Show Overwhelming Support for Union". ^ "Continental joins trend by cutting flights, workers". ^ "Cleveland Hopkins takes hits in Continental cuts". ^ "More jobs lost with CommutAir pulling pilot base out of Cleveland". Retrieved October 10, 2014. ^ "CommutAir to Relocate its Cleveland Crew and Maintenance Base - Airways Magazine". Airways Magazine. 2014-04-29. Retrieved 2018-03-20. ^ "Where We Fly". www.FlyCommutAir.com. Retrieved March 19, 2019. ^ "Last dash out of Albany; Embraer jets into service – Home Page". www.flycommutair.com. Retrieved 2018-03-20. ^ "CommutAir Fleet". aviation.ch. Retrieved 5 July 2015. ^ "CommutAir Fleet Details and History". www.planespotters.net. Retrieved 2018-07-22. ^ "CommutAir Fleet Details and History". planespotters.net. 2017-12-22. Retrieved 2018-01-07. ^ "United Express say Farewell Dash 8". IGN Travel. Archived from the original on 2018-01-10. Retrieved 10 January 2018. ^ "Flight history for United Airlines flight UA4909". FlightRadar24. Retrieved 10 January 2018. ^ "Commutair C5 Flight 4909 07-Jan-2018 KSYR - KIAD". Flightaware. Retrieved 16 January 2018. ^ "Commutair Official Twitter Feed - @C5Recruiting". Twitter. Retrieved 16 January 2018. ^ "Flightaware - N363PH flight KOKC-KROW". Flightaware. Retrieved 16 January 2018. ^ a b "In reply refer to: A-94-74 through -76" (PDF). National Transportation Safety Board. March 28, 1994. Retrieved April 23, 2010. ^ a b "ASN Aircraft accident Beechcraft 1900C-1 N55000 Saranac Lake-Adirondack Airport, NY (SLK)". Aviation Safety Network. Retrieved July 5, 2009. ^ "2 die, 2 hurt in commuter plane crash". Chicago Tribune. January 4, 1992. Retrieved April 23, 2010. ^ "2 DIE IN BAFFLING CRASH OF NEW PLANE". The Buffalo News. January 5, 1992. Retrieved April 23, 2010. ^ "2 KILLED IN PLANE CRASH". The Palm Beach Post. January 4, 1992. ^ "United flight lands off the runway at Presque Isle International Airport". WABI. Retrieved 4 March 2019. Wikimedia Commons has media related to CommutAir.